And that's very true because, if you don't have access to the buyers. you have no one to sell to. Until now, building a list was a lot harder than it sounded. One of the big keys to success in list building is choosing a hungry market. This is really a little known secret to building a list... but it is THE key to success. You can make or break your chances simply by the market you choose to target. Choose the wrong market, spend time building your list, and you can end up with nothing but a worthless list of subscribers who just wanted something free. Let's say you DO choose a hungry market... The next challenge is to create a product with high quality information to give away in exchange for their contact information. CONTENT - First, you have to sit down and write a report full of high quality information. WARNING: "Valuable" does not necessarily mean "High Quality"! Here's why... Imagine you are stranded on a deserted island. You're all by yourself and there is no chance that anyone is coming to save you. In that situation, a big treasure chest of gold might be valuable, but it sure isn't valuable to you. It's the very same thing with list building. There's a difference between information that is just valuable and quality information that your subscriber can benefit from right away. GRAPHICS - Gone are the days where you can publish information online and not have it look good. To make sure your free report gets noticed, you absolutely must have professional design help. These days, you can get a great cover for maybe $50 or $100. This takes time, and you never really know what you're going to get. But if you're not a designer yourself, this is one area you don't want to skimp on. First impressions are everything. COPY - You can have the best graphics in the world, but without knowing how to write copy that gets your visitors to take action, your list building efforts will fall flat. So you really need to develop some skill so you can write copy that sells. TECHNOLOGY - Finally, you need to set up all of the web pages that will be part of your list building system. This includes a domain name, web hosting provider, your squeeze page, and your thank you and download pages. Then you have to make sure that everything works so that your new subscribers have no problems getting the information you promised. Whew... that's a lot of stuff. If this sounds like a lot of work to you, then you're paying attention. Because it is a lot of work. And that's just for a single product. Imagine doing this for 20, 30, even 100 products. It could really drive you crazy. But with the brand new Ready Squeeze list building solution, all of this work is done for you. The products are done, the graphics are done, the copywriting is done and the technology is done. It's all done for you. 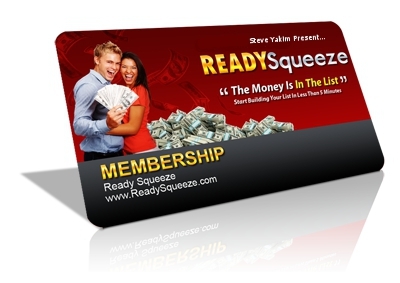 With Ready Squeeze, you simply go get your link and start building your list. As a member of Ready Squeeze, you will instantly have access to a long list of done-for-you products and squeeze pages just waiting for you to use to attract subscribers to your list. Instead of spending time doing all of the hard work by your self, you simply choose, which product you'd like to promote, grab your link and get started! How easy is Ready Squeeze? It's a done for you solution. It's so easy, that there are really only 3 steps. Promote Your Link - When a prospect clicks on your link, they are taken to your pre-done squeeze page, they opt-in to your list and get your pre-loaded, pre-customized report (already done for you) for immediate download. This isn't just any report, because each one is branded with your name, and your affiliate links already inside! It's totally customized without an ounce of effort from you. Spend Your Profits - As your list grows, you will have a growing asset that you can use to generate income virtually on demand. Because of the planning we've put into offering these products, they will help you build targeted lists in markets that BUY. Once you have your list, then you can offer them a whole range of complimentary products and services. Just "rinse and repeat" these 3 steps for as many lists as you want to build... in as many different markets as you chose. Build lists in 3, 4 or 5 niches and pretty soon, you could be on your way to your very own internet empire. Money IS "In the List"
So what type of results are possible when you have access to a targeted list? A while back, I did some research on just how valuable each subscriber on my list was to my business. After some number crunching, I figured that the revenue was about $10 per name. For every name on the list, I generated approximately $10 over the course of the year! If you have a list of only 5,000 subscribers, that's annual revenue of $50,000. Not bad for a single, small list of email addresses. While that's a fairly conservative example, the numbers really can get quite large when you have a good relationship with a targeted list of subscribers. In fact, I have generated as much as $106,000 in sales in a 24 hour period using email to a list of only about 7,000 people. 50% of that was my commission. So that's $53,000 profit in 24 hours. Not a bad day's work. Now there's no guarantee you'll get results like that with your list, but I tell you this just to give you an idea of what's possible when you have access to such a valuable resource. But don't think you have to hit home runs all the time just to be successful. Several lists, generating a thousand or two thousand dollars a month could change a lot of people's lives. I want to make something clear before you jump to any conclusions: Ready Squeeze is not just for beginners. The done for you Ready Squeeze solution makes list building virtually effortless... but the other huge benefit is that it lets you enter and test new markets in record time. Just imagine waking up one day to find out that a certain niche is really doing well online. If you don't already have a list built in that niche, you're pretty much out of luck. It's too late... the train has left the station. But as a Ready Squeeze member, you'll have access to over 100 (and growing) products that you could be promoting in about 5 minutes to start building a list that targets the well performing niche. Ready Squeeze makes list building easy. but Ready Squeeze also makes list building fast. And that's one of its biggest strengths for the intermediate and advanced marketer. You can actually be building your list while all the other guys are still waiting for a freelancer to write their free report or design an ebook cover. A lot of marketers invest all of their time in one market, trying to build a single list. While it might sound smart to focus your efforts like that, unless you have a crystal ball to tell you which markets will create success and which won't, you might get yourself in trouble. Building a list in the Facebook® marketing niche might be smart. It can surely be very profitable. After all, Facebook® is extremely popular. But if you wake up and find out one day that the market's attitude towards Facebook® is souring, you can be in trouble. Then what would you do? Most marketers would have to start over and repeat all their hard work in a new niche. As a member of Ready Squeeze, you can prepare for shifts in the market before they happen. Ready Squeeze lets you build lists in multiple markets without all of the hard work it would normally take to support marketing and list building in more than one niche. With Ready Squeeze, it's done for you. By now, I'm sure you've seen the typical internet squeeze page. There's usually a headline, a sign-up box and maybe some additional copy and graphics to describe something free that's being given away. The squeeze pages you'll be using as a Ready Squeeze member are not your typical squeeze pages. They're far better. Based on our testing, we've added several response devices that will help to boost your conversions. We've tested these strategies many, many times. In fact, when we stop using them, conversions go down. So that's proof that they belong there. And your list building will benefit from that knowledge. Something important you should know right away is that we re only accepting 1,000 new V.I.P Members into Ready Squeeze at the low rate of $27.00 per month. Act fast and you'll get access to all that Ready Squeeze has to offer for only $27.00 per month! The price will never be lower, because once enrollment reaches 1,000 members, the price will be increased to $37 per month. Once enrollment reaches 1,500 members, the program will be closed to new members. When and if we open it up again is anybody's guess, so it's in your best interest to move quickly on this. Your satisfaction is guaranteed and you can cancel at any time, even though we can't think of a good reason that you'd want to once you see how easy this is. FULL of Products to Sell! All new Ready Squeeze V.I.P Memberships include a complimentary 3 month membership to CrazyDealsWeekly.com - That's the world's largest 100% commission website full of additional products that you can promote to your list. The best part is, you keep 100% of the revenue! Between the tools you'll find in Ready Squeeze and the 100% commission products you'll find on CrazyDealsWeekly.com, you can build an entire front and backend marketing system. In fact, it's harder than ever. With the amount of competition that's out there as well as growing skepticism by website visitors, you have to use every available advantage to create success building your lists. If you choose to go it on your own, I wish you the best of luck. I can't guarantee it'll work out for you, but I can guarantee you'll have to work hard for any chance at success. With Ready Squeeze, we've done all the hard work for you. We've made things so simple that all you have to do is get your link, promote your link and then spend your profits. List building just doesn't get any easier than this. Remember, this is a very limited time offer. The membership will fill up (and close) very quickly. We're only accepting 1,500 members into what is, by far, the easiest way to build your list that s ever been created. There are huge numbers of potential buyers out there waiting to hear about products and services that can help them. If you have a list, then it s easy to connect those products with hungry buyers. If you don t have a list, then when do you think the best time to get started is? To Never Raise Your Subscription Price! YES! Steve, I know that I'm definitely not going to miss my chance to subscribe to "Ready Squeeze"! I understand that I will be billed only $27.00 every 30 days and that I may cancel my subscription at anytime, for any reason. You are probably wondering why we are only charging such a small amount for a system that will literally change the way you do business online. Trust us, there's no catch - however, the "ReadySqueeze" membership is available for a limited time only at this introductory price - $27.00. Avoid disappointment and Join Now! P.S. I can t really stress to you how easy this is. It s as close to a list building silver bullet as you re going to find. Steve was the first person to create a squeeze page generator to help other marketers with their list building efforts. These days, you can find squeeze page generators all over the place. Unfortunately, the squeeze page itself is just the beginning. If that s all you have, you really have little to no chance of building a list. Ready Squeeze is a totally done for you list building solution. We've taken all the hard work out of the process and made list building literally as easy as 1, 2, 3. P.P.S. One more thing I forgot to mention. As a new Ready Squeeze member, not only will you have access to over 100 done for you products to help you build your list but you ll also have access to them for your own education! There are currently over 100 reports in the system with hundreds more in the pipeline. And who knows what you can do with the knowledge you ll get by going through all of the reports. P.P.P.S. Don t forget: You can also generate additional revenue by recommending new members to Ready Squeeze. Everyone who signs-up to your list will have the opportunity to use Ready Squeeze for themselves. If they become a member, you get paid a 50% commission INSTANTLY via PayPal®. And that s on each and every sale you generate.